Technology has been known to create a distance among family members either because they are glued to the TV or computer screen or busy interacting with virtual friends across the globe. The quality of conversation between parents and children has taken a turn for the worse as face-to-face communication becomes a rarity rather than the norm. It is therefore encouraging to have software application that enhances the quality of communication amongst family members. Family Matters put things into perspective in the twenty-first century when values and priorities have often become distorted. 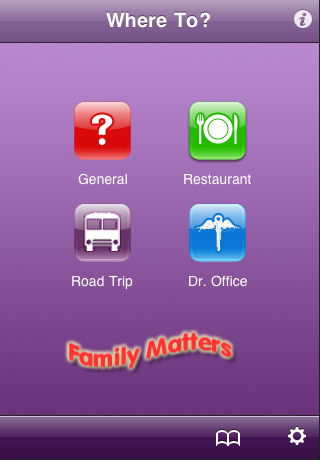 Family Matters is an iPhone and iPod Touch application that helps parents to communicate better with their kids through the family activities offered by this application. It offers a set of questions and activities designed to help parents to have deeper conversations with their kids when they take part in these activities. The activities are mostly venue-driven. In other words, the activities are geared toward users’ geographical location. It covers common places parents and kids may engage in conversations or need to pass the time such as restaurants, waiting rooms or on long road trips. As a joint promotion with My Digital Life, the software developer, Weiner Family Studio is giving away two promo codes for Version 1.0 to two lucky winners. To earn yourself a chance to win this iPhone and iPod Touch software and have fun with your family members, just write and post a comment stating why you need this software. All comments must be posted on or before 01:00 AM on December 17, 2009 according to comment posted time (UTC+8). Winners must allow his or her addresses to be given to Weiner Family Studio for product delivery. Contest closed. Winner is Sherrie Beek (only one winner, as nobody else states why they need the software). A note behind is that the developer is donating some proceeds in December to the Ronald McDonald House Charities for helping families of sick children. More details available here: http://www.weinerfamilystudios.com/xcms/modules/smartsection/item.php?itemid=5. My Digital Life’s decision is final, and My Digital Life reserves all rights to change any terms and conditions without prior notice. Do check out more free giveaway available at My Digital Life.